Joan Rivers died today. She was 81 years old. I found her fascinating. I remember seeing her on Johnny Carson's show when I was a kid in the 1970's and 1980's filling in for him when he was on vacation. She was different. Funny, sometimes seemingly awkward, and yet knew exactly what she was doing. She had memorable catch phrases ("Can we talk?" / "Oh, grow up"). No subject was off limits. Her successes and her failures were all in view of the world. I really grew to admire her over the years. Her life was all out there for people to see. She laughed at herself, her misfortunes, she told it like it was even when it upset people. Most people don't have that ability. There's always something to hide, often the need to be politically correct for a lot of the public. She rarely apologized for anything she said or did, which made her even more awesome to me. I think what I admired most about her is the work ethic that she had. She was a senior citizen and yet still traveled constantly, doing gigs wherever they would write her a check. Most people just want to retire when they reach their 60's, 70's, 80's. She worked right up to the end. She probably never realized the legacy she created, the legend she was, and the inspiration she is to little people like me who sometimes wonder if life would be easier to just give up. She never did. Rest in peace, Joan Rivers. There will never be another one like you. 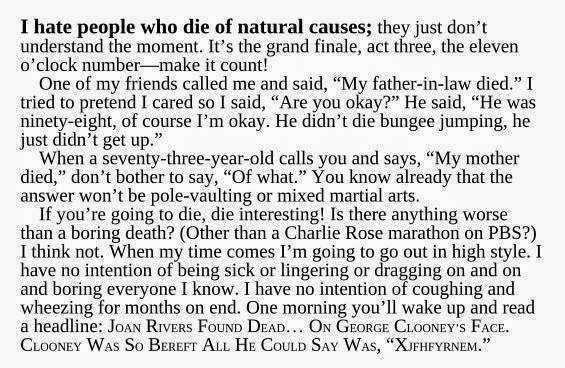 I ran across this little piece someone posted on Twitter that she wrote regarding death. It's very Joan Rivers.